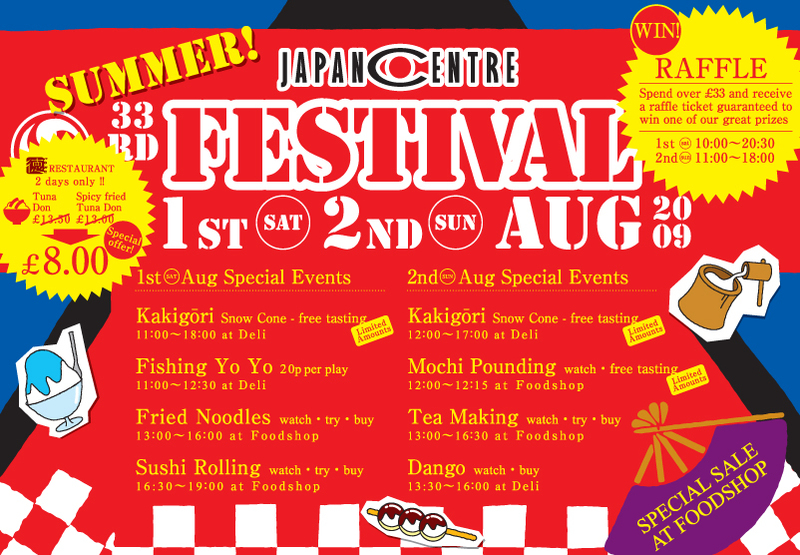 To celebrate the 33rd anniversary of Japan Centre we’re holding a two day festival this weekend 1st-2nd August. 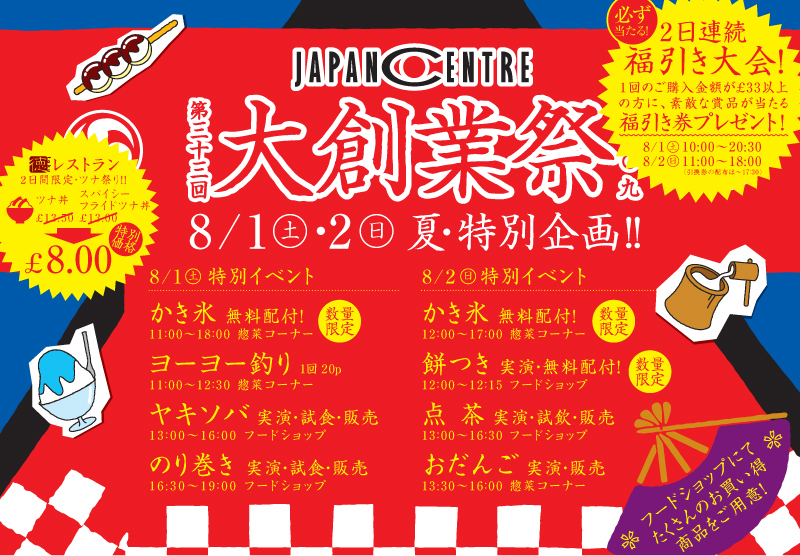 There’s lots going on over the weekend all to do with Japanese Culture – demonstrations, special offers, free tastings, raffles…so much fun packed into two days! Kakigōri – Shaved ice drizzled with different flavoured syrups. Free! Fishing Yo Yo – Like ‘Hook-a-duck’ but with water filled balloons and using a paper hook. 20p per play. Fried Noodles – Watch how to make Yaki Soba noodles, try it for free and buy ingredients. Sushi Rolling – Look and learn as the professionals make sushi, try it for free and buy ingredients. Mochi Pounding – Watch and join in pounding mochi (rice cakes) and try them after for free. Tea Making – Learn how to make green tea, try and buy to make at home. Dango – Experience how dango is prepared (sweet Japanese dumplings) and buy to eat. Spend over £33 at Japan Centre foodshop, bookshop or restaurant and receive a raffle ticket to win a guaranteed prize. Sale on loads of great items all weekend in foodshop. To join in the fun, come to Japan Centre, 212-213 Piccadilly, London. Posted in Books, Food and tagged festival. Bookmark the permalink.